A Montessori preschool teacher and director of many years, Jessica Salinas has two grown sons who taught her lots of fun ways to play while shopping. She lives in Austin with her husband; their dog, River; and their bird, Skyline Scalene Salinas. Gather more of Jessica’s wisdom at her blog, That Happy Hum. Shopping with a preschooler can be a challenge—there are so many things designed for them to want! But we can’t always leave them at home, and even if you can, why overlook this opportunity to use the supermarket’s educational potential? With effective questions, parents can help their child practice academic skills, especially math-related ones. And, with effective modeling, parents can help their child learn how not to be overcome with desires for products that, one aisle over, they didn’t even know existed. When playing with math with your child, the most important vocabulary words are set and just as many. In the produce section, write a numeral between one and nine on a piece of paper, and show it to your child. Hold open the bag, and ask him or her to put in “just as many apples as that”: the number you’ve written. Don’t say the number out loud, however. This adds a layer of challenge to the task—decoding the number without the verbal cue, which children usually know better. It also gives you a gift – information about what your child knows and doesn’t know. Suppose you’ve written a 6, and your child puts in 9 apples. Guess how many apples you are buying today? That’s right . . . you are buying 9. And furthermore, you aren’t going to correct your child’s mistake—at least, not by saying anything more just now beyond “Look at you counting! Go, sweetheart, go!” This is because we want to stay playful and keep your child feeling successful. Adults need to always look for what the child is doing right, and emphasize that. If you say, even sweetly, “Oops, that was a six—let’s see how many apples got into the bag . . . seven, eight, nine . . . oops . . . too many!” this correction only shows them they did it wrong. Here’s how to re-introduce that 6 means six: In the next aisle, you take the turn. Write down 9, and have your child tell you to get “just as many.” Then count out loud as you select cheese sticks, or whatever. You can also bring a bag with the magnetic numerals from your refrigerator, and pull them out. This is actually even better, because it’s more tactile. I love the word susceptible here—it’s expansive vocabulary, and even with a very young child, is evocative, and when he or she sees you standing in front of an enameled orange saucepan, all will become clear. “Uh oh . . . I think it’s happening . . . help me, sweetheart! This orange enameled saucepan is very beautiful! I want to buy it, but we already have a saucepan! Quick, take my hand, pull me away.” Let your child pull you, even as you push the cart he or she is sitting in, while giving yearning glances over your shoulder toward the saucepan and reaching back for it. “So beautiful . . .” When you are far enough away, shake your head like someone awakening from a magic spell, and thank your child for saving you. 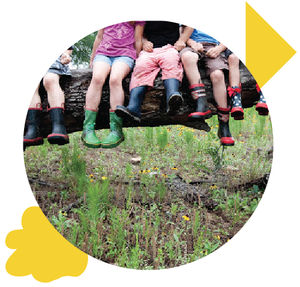 In this guest post from Katherine Parlette, you’ll learn about Julia’s Garden, a Montessori program in the heart of Travis Heights where young people will have the opportunity to grow and thrive right alongside the garden plants they tend. Children who are coming into their third and fourth years of life are in their sensitive periods for reading and writing. Many programs offer a chance to explore nature, exposure to languages, and music and/or arts and crafts activities. Although all of these things are important for the preschooler and are also part of our curriculum, what sets us apart is our AMI-trained Guides, who have the time, resources, and expertise to sit down with your three-year-old and make sure that lessons are offered at the exact point in the child’s development when he or she is ready to receive it. It’s this accountability for academic learning that makes us different from many other home-based programs. 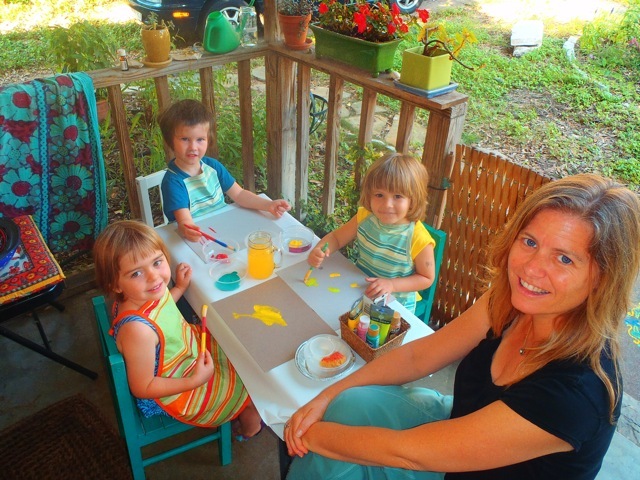 Julia’s Garden classes will be held in the sacred space of a private home, which, through years of teaching in various environments, we have found to be young children’s preferred kind of space for absorbing knowledge. Traditional school buildings in commercial settings are not ideal places for small children to spend their formative years. Vinyl flooring, fluorescent lights, and limited outside time all go against the child’s natural tendencies to learn through their senses and through movement. Plastic toys, unbreakable dishes, and padding send the message that children are clumsy and not to be trusted. In contrast, AMI Montessori environments are lovingly prepared with materials that are pleasing to touch and to see. The Children’s House, or “Casa de Bambini,” as Dr. Maria Montessori called her first classroom, is a true home for children where they can work, play, and take ownership of their environment. Having access to materials made from nature, like wood and wool, show respect for young children and in turn help them develop respect for and knowledge about nature. Items made of ceramic and glass help children learn balance, patience, and responsibility. The result of this approach is a confident and capable child. In our backyard, where nature leads the way, children are able to develop concrete language and fine motor skills literally from the ground up. In a garden classroom, touch, taste, smell, and sound allow them to fully take in the world around them. Harvesting their own ingredients teaches respect for food, and learning the process by which it arrives at our table helps avoid future battles around nutrition and eating disorders in the teenage years. Gardening also builds important life and survival skills that will assist in your child’s development all the way into her adult years. In the fall, the children will have the opportunity to harvest the summer crop and prepare snacks made from organic ingredients. Simultaneously, they will be preparing the winter garden. We will talk about which vegetables and fruits grow best in our climate in the winter months and choose our favorites as a class. Then we will plant them together and continue to water them and weed the garden in order to truly see how an organic garden grows. Composting is also a big part of our daily regime: all food we do not consume goes into the compost bin so that children see the importance of recycling and that nothing goes to waste. Julia’s Garden is a community-based class program. We encourage parents to help us in the garden and form adult friendships. 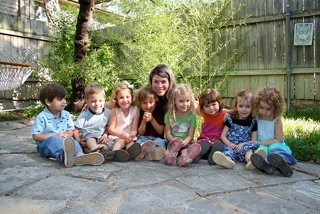 Montessori is a family, and the mixed ages give the children opportunities to be teachers as well as students. We bring children into our Primary classroom before age 3 so that they can remain with the same teacher for a longer stretch of time. Having fewer transitions to work through during this tender time means more space for growing and learning in the environment. It also means that there are no delays in the child’s education from toileting training setbacks. By starting children at school in the midst of their process, we can help them to become successful at independent toileting well before their third birthday. There’s a lot “growing on” at Julia’s Garden in 2014! Come and see for yourself or visit our website. We hope to see you soon! It is a pleasure to welcome Katherine Patton as Alt Ed Austin’s newest guest writer. Katherine not only directs and teaches at The Joyful Garden preschool but also is an accomplished urban farmer who conducts Urban Farm Camps for both kids and adults. Here she shares the rationale behind her agricultural work with the very young as well as some tried-and-true tips for parents and others who want to grow things with kids. I’ll be honest: I started integrating farming activities into my preschool program because of my own passion for being outdoors and growing things. To me, it has always made sense to structure my work with young children (aged eighteen months to three years) around what interests me most. Being outside, growing and tending plants and animals, and turning the end results (fruits, vegetables, honey, eggs) into delicious food on the table are hobbies that have become integral to my life and livelihood. Sharing them with the children I teach and care for was just a natural for me, in terms of interest (mine and theirs), setting (outdoors), and results (beautiful feasts for the senses; the hands, eyes, ears, nose, and taste buds can all enjoy the process of raising our plants & animals). All that is wonderful, but to me, it’s all about the daily experiences with the children. No moment is more positive, more filled with potential, than the moment each morning when I push open the farm gate and walk through it with my young charges. Pip the dog runs ahead to check around the chicken pens. The children and I straggle behind, taking in the berry and herb beds, sometimes finding flowers, leaves, and fruit to pick, smell, and taste. A rooster’s crow or the approach of one of the cats, purring and begging to be petted, might stop us in our tracks. One is an occasion to clap our hands over our ears, the other to stop and gently touch soft feline fur. We eventually reach the shed, from which I can extract the huge chicken feed container and several small sand pails. Children grab scoops and fill the pails with chicken feed. They practice their social skills and conflict resolution, working out who should use which scoop. Fine and gross motor skills are strengthened. Resilience gets a workout when someone is disappointed by the scoop that he or she ends up with. I might count the number of scoops going into the pail. Soon pails are full and scoops go back into the container. Children observe while I dump the feed into the feeders and the chickens chow down. When we tire of observing—sometimes quite a while later—we check for eggs. Many times there are some that we can count and carry, sometimes none are waiting for us. Our next stop is the garden, where we check for ripe vegetables for our brunch table. Very often, undersized/underripe fruits and vegetables are picked prematurely. It’s all a part of learning in the garden. Over time, the children learn that tomatoes and berries are not ready until they are richly, darkly colored. The proof is in the tasting! Cucumbers and summer squash can be either too small and hard or too large and seedy. They experience the range over time during our indoor work time, when we wash and slice the garden’s bounty for brunch-time consumption. 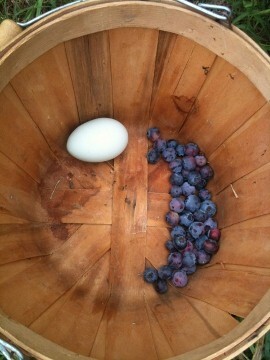 Sometimes the garden’s offerings make it onto the table; sometimes not. When we sit to eat our mid-morning meal, not every child likes, or will even taste, our harvest. But I know that each exposure to a new food increases the chance that a child will try and enjoy it at some point. If it takes, as some experts say, ten exposures to a new food before a young child will actually taste it (some say fifteen exposures), I know that each child with me that day has seen that food twice—once in the garden, and once at the table. They see me tasting and enjoying it, and with any luck, at least one of their peers will be enjoying it also. In this simple way, we are laying the foundation for healthy eating habits. Focus on the process, rather than the product. 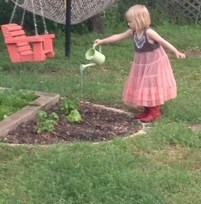 A toddler might focus on scooping soil, to the exclusion of getting to the next steps of planting seeds to sprout, and then watering, and so on. Provide the materials and tools that are capturing the child’s focus right now. You can always seed separate starting trays while he or she is occupied with all that scooping. Start small. One to three pots filled with dirt alone might be enough for a young child to experience (touch, smell, even taste) as a start. Start some seeds in other pots, set up and out of the way; your kiddo will likely be delighted to help you harvest when they bear fruit. Keep it safe. Examine the environment for sharp edges, biting insects and spiders, and other hazards before offering it to a young child. Practice organic cultivation rather than using chemical pest deterrents and fertilizers. Research livestock-borne disease risk before allowing your child to interact with animals, and keep a close eye on all child-animal interactions. Chickens and other farmyard animals can frighten or injure a young child through just their natural behaviors (pecking, quickly taking flight, crowing). Teach your child to eat only those plants and fruits that you have approved for consumption. A good mechanism for enforcing this, which has nothing to do with asking permission, is to make a habit of washing everything before tasting. This gives the grownup a chance to review what will be consumed in advance of dining. Grow plants that are easy and that you like. If you hate tomatoes, don’t grow them! 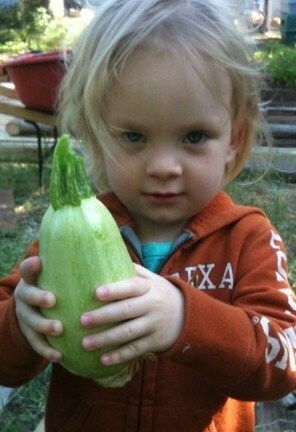 Grow food that you will enjoy sharing with your child. If there is a vegetable that you know she or he loves, plant some seeds. Once your kid enjoys picking that favorite from the garden and eating it, it’s a short stroll to the next pot, where a soon-to-be-favorite is growing. Molly Manewal has worked with kids in many diverse settings, most recently in her own small schoolhouse for young children. She is currently beginning a sabbatical during which she’ll be living in Southeast Asia, mostly learning by observing—a not-so-simple act she understands deeply and writes about here. I am incredibly lucky; I work with preschoolers. I get to sing songs, assist small seamstresses and carpenters, and act as an impartial (usually) intermediary for players in a hostile takeover or lovers’ spat. But, arguably, the best part of my work is simply watching kids. There is very little that goes on with their life at school of which I need to be an active part, so I get to watch them be their beautiful and fascinating selves. For the most part, they are self-contained learners capable of far more than most people assume. What a joy it is to see a child come up against an obstacle, struggle with it, and emerge victorious. (Please see Kami Wilt's insightful guest post on frustration.) Although I help them in countless ways, nothing I do can give them that sense of accomplishment. I have knowledge and skills they don't yet have, and I can share these with them, but genuine and lasting learning results from their own impulses, their own work. To be truly helpful, I must remain loving and neutral, and observe what is happening with each child. My training is primarily in the Montessori Method. Early in the twentieth century, Maria Montessori proposed a pedagogical system in which the innate drive toward self-construction was trusted and respected. This led to an indirect teaching style centered on observation. She saw the role of the guide (teacher) as that of witness and facilitator. In order to understand how we can support learners, we must first find out where they are. Observation is the starting point. There is only one basis for observation: the children must be free to express themselves and thus reveal those needs and attitudes which would otherwise remain hidden or repressed in an environment that did not permit them to act spontaneously. I don't just love watching kids; I love watching other things too. I find value in stepping back and simply observing. Not only do I learn a great deal; I also feel grounded in my environment and appreciate my surroundings. I foster this practice in the children I get to interact with by availing them of the tools with which to observe. We cannot create observers by saying, “observe,” but by giving them the power and the means for this observation, and these means are procured through education of the senses. When we are observing, we don't have an agenda, and when we don't have an agenda, we are open and receptive to learning. Just watching can help us simply to be with what is going on and truly see it. It also can give us a moment to ask our­selves, “Do I need to involve myself in this? Is this really any of my business?” Observation often keeps us from jumping to conclusions. It not only informs us about our world but also aids us in developing a practice of nonjudgment. We all value the skill of discernment because it helps us to make decisions, but I'm guessing most of us at some point wish we could be less judgmental. If one of our goals as parents and educators is to foster in­de­pen­dence, we have to refrain from “helping” too much, an impulse that is sometimes difficult, or, for parents, perhaps well-nigh impossible, to control. But when we commit our­selves to observe more, to be still, then children have the chance to grapple with life. This is where true learning happens, through direct experience. So we support the children by show­ing that we honor the un­folding of who they are. We give them an encouraging smile or a sincere “You can do it”—all the while trust­ing that they will gain from their experience and will be okay. Imagine if we tried to assist a butterfly in emerging from its chrysalis. We know (from squatting down quietly, watching it happen) that it would be a de­structive inter­ference to in­volve our­selves in that delicate yet com­pletely per­fect pro­cess. So, while child­ren need a safe, rich, and sup­port­ive en­vi­ron­ment, their un­fold­ing is something to be­hold, celebrate, and, for the most part, stay out of.